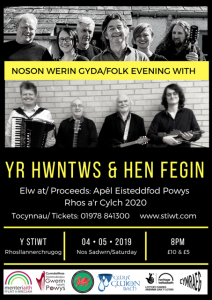 Really looking forward to bringing our South Walian Tribannau to Flint and support fundraising for the 2020 Powys Eisteddfod! 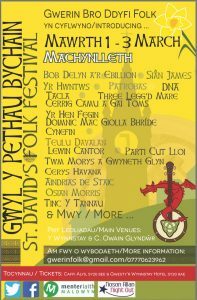 YR HWNTWS PLAYING “GWYL Y PETHAU BYCHAIN FESTIVAL” 1st MARCH 2019. MORE DETAILS ON OUR EVENTS PAGE!! CLICK ON THE BANNER BELOW TO GO STRAIGHT TO THE FACEBOOK EVENTS PAGE FOR THE GIG WITH TICKET DETAILS. Gregg Lynn founded the band in the early 1980s and, over the years, they have toured extensively in Europe as well as appearing on BBC, S4C and Radio Cymru. 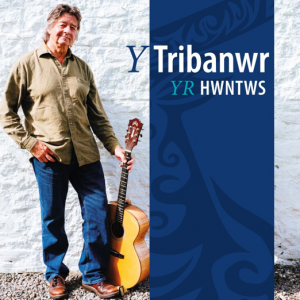 “Yr Hwntws” is now made up of Gregg Lynn (vocals and guitar), Nia Lynn (vocals) Bernie KilBride (fiddle) Imogen O’Rourke (flute and vocals) Dan B. James (mandolin) and Dean Ryan (double bass). The name “Yr Hwntws” refers to people from the Southern regions of Wales and the band is presently researching songs from those areas to be be recorded and produced, along with an explanatory booklet, in the summer of 2018, ready for the National Eisteddfod in Cardiff at the beginning of August. CLICK ON THE ALBUM COVER BELOW TO ORDER THE NEW CD NOW!! !